I travel all over Minnesota participating in Twin Cities Sisters in Crime panels, visiting bookstores, book clubs, festivals, and libraries. I love visiting new towns, meeting other Minnesota authors and mystery fans! I try to keep this page up-to-date with all upcoming events, and I will add events as I book them. I hope you’ll stop by and say hi! Did I mention I love to be invited to book clubs? Photos of some past events followed by a complete list of past events. 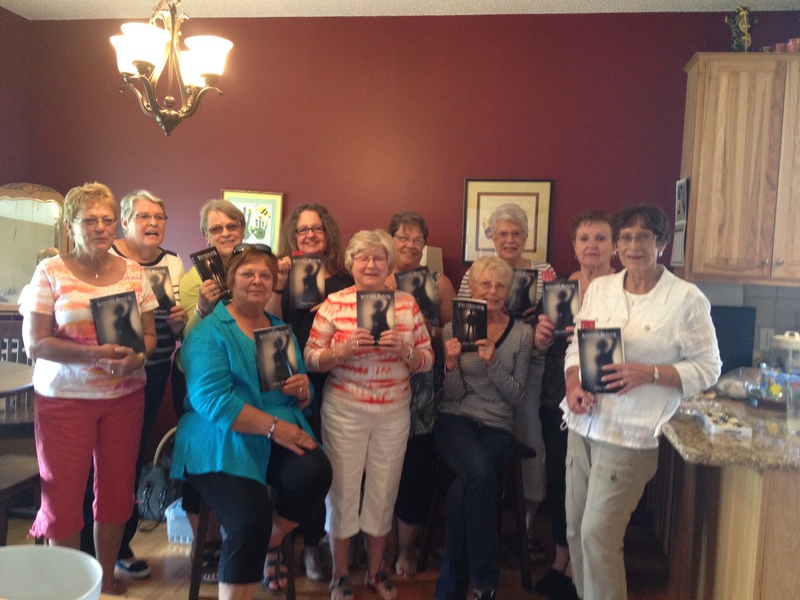 Book club in Fifty Lakes! My very dear girlfriends I grew up with in Olivia. Karen and Allie Rudin at Barnes and Noble Ridgedale. I’m with organizer Sue Ready at the Northwoods Art and Book Fair. Fun panel at Maple Lake! Nov 30 -OARE Scholarship Breakfast Craft Fair 6:30 to 9:00 a.m.
November 7, Totally Criminal Cocktail Hour, Dock Cafe, Stillwater, dinner and my author talk, 4:30 to 6:00. Call for tickets, only $10. October 15, Wells Public Library, Wells, MN anthology: Dark Side of the Loon Panel, 6:30 p.m.
August 10 -11. Long Lake Corn Days, St. George’s Church, Long Lake 11:00 to 5:00. May 19, Edina Art Center, Anthology readings: Dark Side of the Loon 10:00 a.m.
May 5, Once Upon a Crime bookstore – Launch of the anthology: Dark Side of the Loon. I have a short story in this anthology called “You Picked a Fine Time to Kill Me Lucille” set during the great Halloween Blizzard of 1991. March 31, Once Upon a Crime bookstore, Anniversary Party. 12:00 to 2:00. I’ll be there for sure from 12:00 to 12:30. February 10, Author Live Read Day, Chanhassen Library, 11:00 to 4:00. My reading is at 2:20. Jan. 31, Wayzata Library TCSIC panel 6:30 p.m.
Nov. 14. PEN – Ausburg Library, Richfield 6:30 to 8:00. Spoke to editors about how authors and editors can best work together on plot and storyline. November 9, Barnes & Noble Minnetonka Mystery Night – Some of Minnesota’s favorite authors will be present, including yours truly and Barb Deese. Big doings! It’s going to be fun! Join us! 7:00 to 9:00 p.m.
Oct. 14, Twin Cities Book Fest, State Fair Grounds, Sisters in Crime booth, 9:00 to 2:30. Sept. 19, Champlin Library, Mystery Book Club, 6:30 p.m.
December 2, Osseo Retired Teachers’ Scholarship Waffle Breakfast & Craft Sale, 6 to 9 a.m. Public welcome. $8.00 breakfast all proceeds go to the scholarship fund. I’m selling books! Books make a fine holiday gift. November 16, Saint Peter Friends of the Library, Community Center 6:30 p.m.
October 15, Twin Cities Book Festival, Fairgrounds, Free! Great speakers. 9:30 to 11:30 Twin Cities Sisters in Crime table, 2:00 to 5:00 North Star Press of St. Cloud table. May 7, Princeton Library, Women Crime Writer’s Panel, 1:00 p.m.
April 28, St. James Public Library, 7 pm. March 15, Orono Community Ed class on writing and publishing, 7 pm. February 24, Friends of the Waconia Library, 12:45 p.m.
February 27, Eat my Words Book Store, North Minneapolis, 3 p.m.
December 4, Osseo High School, Holiday Breakfast and Craft Sale 6:00 a.m. to 9:00 a.m.
November 7, St. Peter Holiday Fare, 10:00 to 3:00. October 21, , Delano Sr Citizens’ Center, 10:30. October 17, Twin Cities Book Festival, 10:00 to 3:00. May 16, Book World, Kandi Mall, Willmar, MN 12:00 to 3:00 p.m.